FUNNY JUDICIAL QUOTES: In honor of this being th e 100th Judicial Training Update issued since 2010 I offer a bit of uncharacteristic judicial humor. 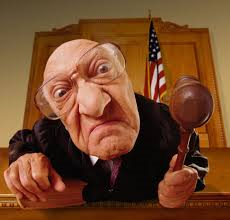 If anyone has ever questioned whether judges too have a sense of humor, you need look no further than this top 10 list of the funniest judicial quotes found in the legal blogosphere. This entry was posted in Funny Judicial Quotes, JUDICIAL PHILOSOPHY, RESOURCES & SAFETY and tagged Funny Judicial Quotes. Bookmark the permalink. Alan, I don’t think that picture does you justice at ALL!!! Stevan S. Yasgur Suite 550 3300 Edinborough Way Edina, MN 55435 952-893-9393 NOTICE: This E-mail (including attachments) is covered by the Electronic Communications Privacy Act, 18 U.S.C. §§ 2510-2521, is confidential and may be legally privileged. If you are not the intended recipient, you are hereby notified that any retention, dissemination, distribution, or copying of this communication is strictly prohibited. Please reply to the sender that you have received the message in error, then delete it. This email is not, nor shall it be deemed to be, legal advice or counsel, unless the recipient already has an attorney-client relationship with the firm or me. This email does not create an attorney-client relationship. Thank you.